Make your personal style statement while adding value to your home with Doors Plus’ impressive range of external door solutions. If you are in the process of replacing your doors or renovating your home, we have hundreds of options to suit your needs. Whether you’re looking to replace a front or backdoor, design one that opens up onto your deck or patio, or install a smart entrance solution for your garage, we have functional and attractive options for you. Available in a variety of styles and materials, each with their own unique features and benefits, our high quality doors will help you protect your family, express your personal tastes and increase your home’s street appeal. Whether your home has traditional, heritage or contemporary architecture, our doors make it possible for your home’s exterior to perfectly complement its interior. To find quality doors for your home, and enjoy a no-fuss shopping experience, visit one of our showrooms today. 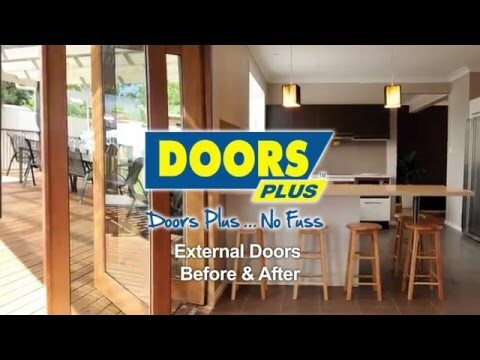 At Door Plus, we have a wide range of external doors. Available in a variety of styles and materials, you will find numerous options that meet your needs and budget. Sliding and Stacking: Both these options are ideal for larger spaces. They create easy access to outdoor areas and alfresco entertainment spaces. Bi-Fold: This is a modern and practical way to extend your entertainment area and bring the outdoors in. You can enjoy your beautiful view while remaining protected from the elements. As replacement doors specialists, our products are designed with the ability to be adjusted to suit your requirements. We provide free measure and quote and expert installation services for all our products. In addition to these services, we can paint your selected composite door from a range or, in case of our solid timber doors, we can stain them to provide a beautiful finish and bring out the natural timber grain. We fit, paint, stain & deliver. Please Select How did you find us? Yes I want to receive information on weekly specials and upcoming sales. Our qualified staff are available, 7 days a week, to assist you in choosing the right doors for your home. Once you have made your selection, you can arrange for a FREE measure and quote. Click here to find a store closest to you.